Satellite TV, WI-FI, washing machine, dishwasher, microwave, air-conditioning (bedrooms only) , CD/DVD player, toaster, cooker (4 gas rings), ironing facilities, hairdryers. 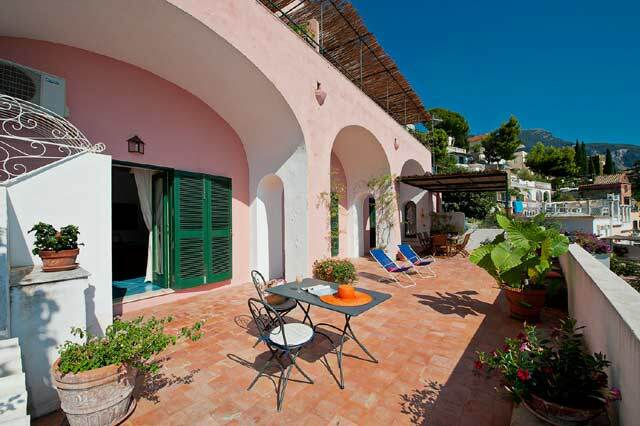 Villa Il Gallo is a two level villa built in the 19th century , located in one of the most beautiful spots of the town. 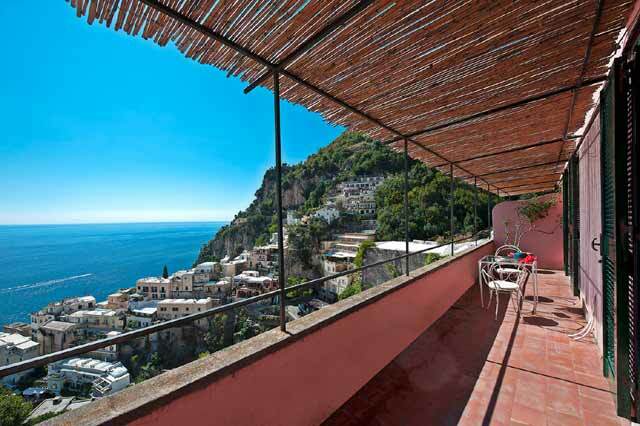 This house is especially attractive for its spaciousness and proximity to the lively center of Positano. 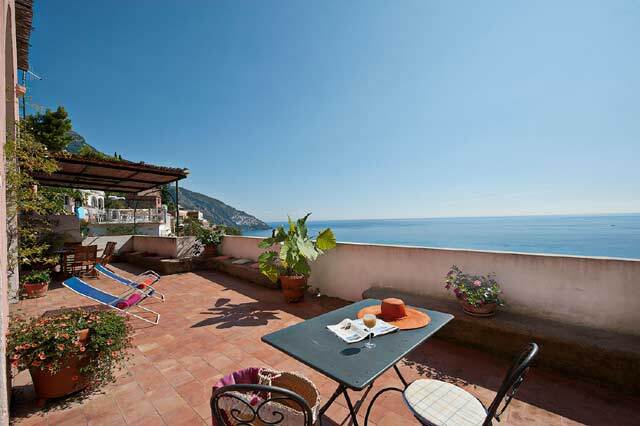 At Villa Il Gallo guests will fully enjoy the pleasure of a stay into a charming and authentic ancient house of the Amalfi Coast.. 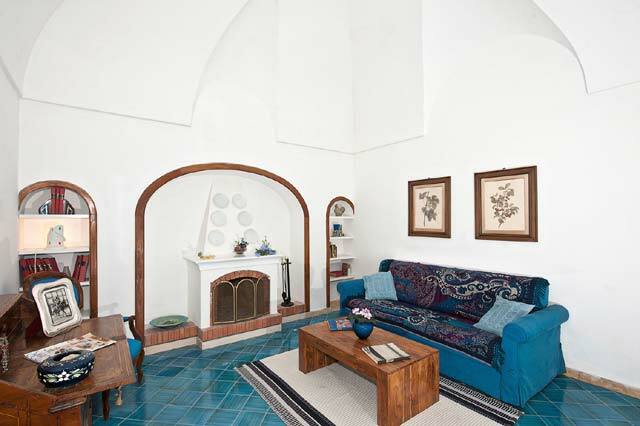 The spacious interiors have high vaulted ceilings and thick stone walls, which is characteristic of the ancient buildings of the area. 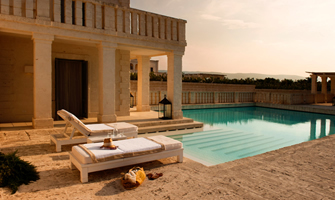 The interiors have been recently restored , and furnished with taste and charm with antiques ( some very precious consequently the villa is not suitable for children under 12 years of age) quality pieces , prints , ceramics and paintings. Designed to make your stay as comfortable as possible, the many modern amenities include independently-controlled central heating and air-conditioning , a phone for both incoming and outgoing calls , satellite TV, clothes washer, dishwasher , WI-FI, etc. 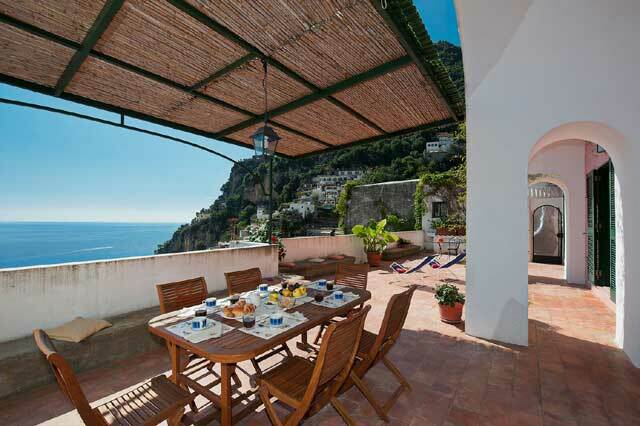 The villa features three different terraces with commanding view over the bay and the town of Positano. The terraces are beautiful planted with bougainvillea, roses and other local ornamental plants. Beside the villa is a delightful garden planted with seasonal vegetables, if in season the produce is available to guests. Situated high up in town, naturally there are steps to climb ( approx. 83.) but for those seeking space, privacy, comfort and above all wide panoramic views of the sea and of the village , the climb is worth . Parking may be tricky here but there is no need for a car as restaurants, bars, boutiques and all immediate necessities are close at hand and a short walk or bus ride downhill leads to the town center and to the two beaches. However, if you do have a car, paid garages ( to be booked in advance) are in the neighbourhood Additional charge about 20 euros per day must be paid locally. Accommodation is spread across two levels. The main entrance leads on a large panoramic terrace, part of which, shaded by a pergola, is suitable for dining with a wood table for 6-10 people. Three large rooms of the ground floor have direct access to the large panoramic terrace through glass doors and wood shutters. There is a spacious double bedroom with en-suite bathroom with shower and separate dressing area, a warm and spacious living room comfortably furnished with a three seated sofa , two armchairs and an open fireplace, a dining room with a round dining table and a flat screen satellite TV. The dining room has direct access to the kitchen which is fully equipped with gas stovetop, microwave, dishwasher, washing machine and an additional window overlooking the water. From the kitchen, through a glass door, you enter a panoramic side terrace bordering the garden cultivated with seasonal vegetables; the terrace is suitable for dining with a table for 6/8 people shaded by a sun umbrella. An internal staircase of 18 stairs leads from the dining room to the second floor. The second floor contains a small corridor which gives access to two double bedrooms. At the end of corridor is a large bathroom with shower. direct access to a balcony plenty big enough for lounging and eating out. 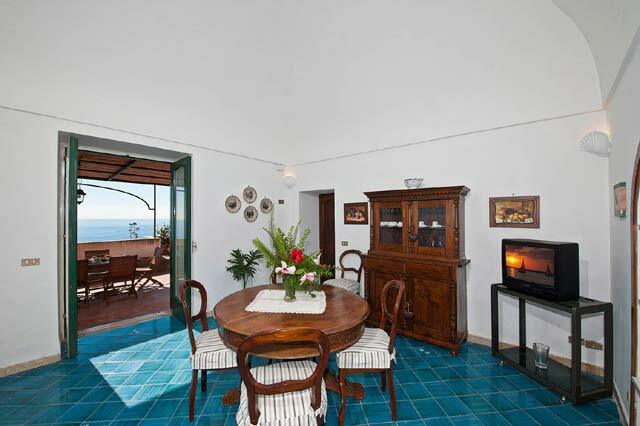 The balcony is shaded by a pergola with a bamboo roof and enjoys wonderful views of the sea and of the village. Villa San Gallo will be reached from the street level going up an external stairway which consists of approximately 83 steps. The entrance of the house is only a short walk away from the one-way internal road housing local traffic and Positano´s inner transport system only. Shops, restaurants and cafés can be found along the internal road , within 100 meters from the house. At the same distance is a pay parking garage (where a space can be reserved in advance) and a bus stop for the local yellow-bus that circulates around Positano and takes to the pedestrian area downtown ( bus ticket is 1,50 euros per person per each trip) . The pedestrian area can also be reached on foot through the old, typical ramps of stairs and romantic lanes which characterize Positano ; the local bus will take guests back up from the centre down below. 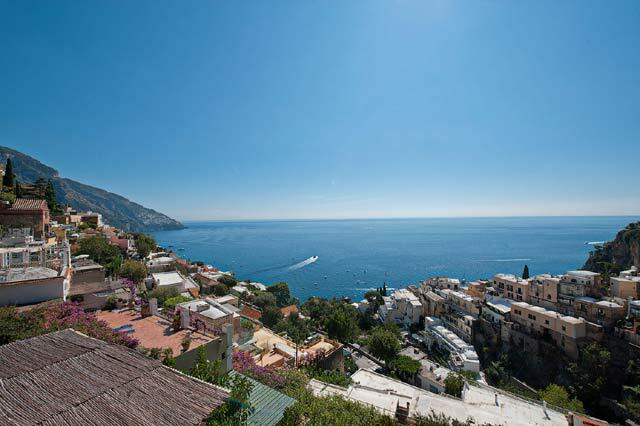 From the pedestrian area , the main beach of Positano, called Spiaggia Grande, can only be reached on foot in 5/6 minutes by following a charming downhill alley closed to traffic, which will take to the beach in approximately 600 meters. This alley is full of colourful shops and boutiques, where guests will be able to shop for fashion and local hand-made goods. 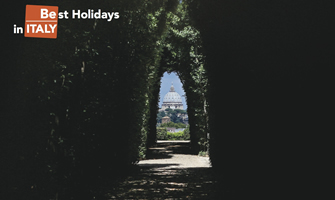 At about 1,5 km far from the house is the SITA bus stop which offers regular service to and from Amalfi and Sorrento , every 45 minutes / 1 hour and can be reached by local mini buses . 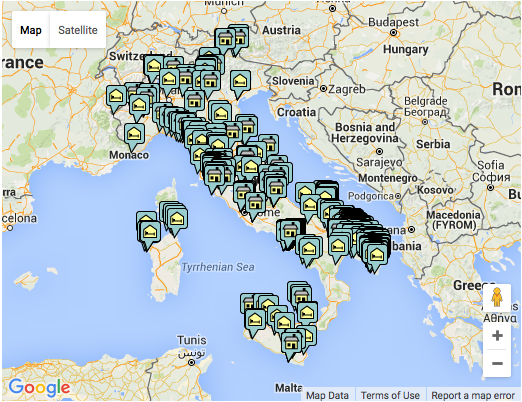 Naples 70 Km, Rome ( Fiumicino) 330 Km.